Hugh Banton made an appearance on Harmonium in Chipping Camden. 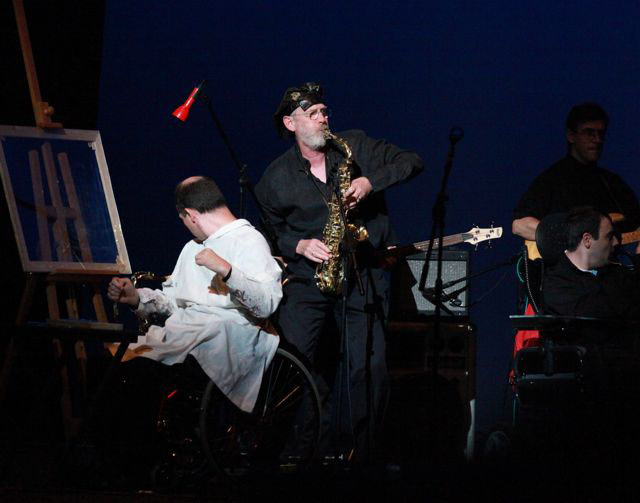 Dave Jackson continues to enthral the disabled and abled with his Soundbeam extravaganza. 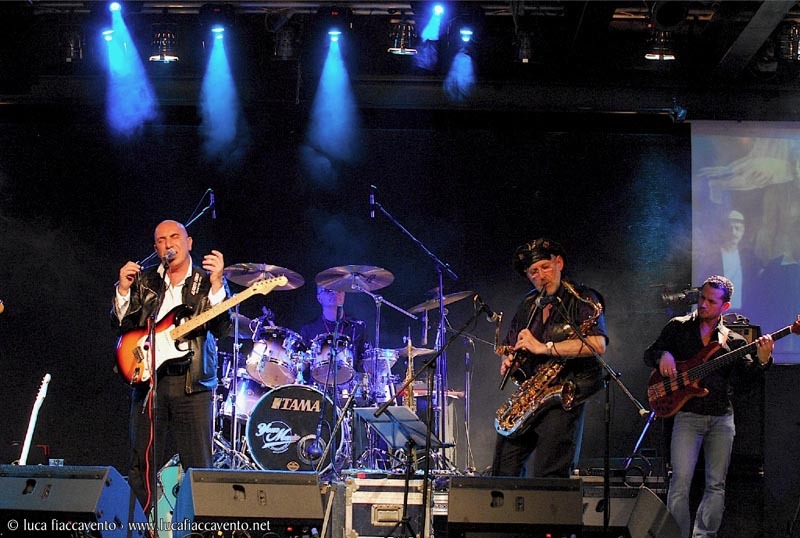 Below are photos of him taken in Modena, Italy in May 2011. - Peter Hammill in his journal entry "A Complex Web". 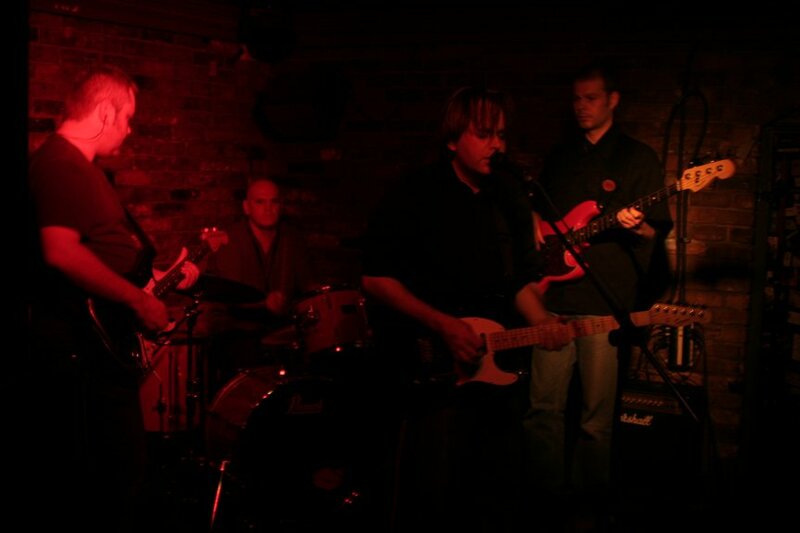 The new album was released on 14th March 2011 and is called A Grounding In Numbers. "So...next? We’re looking at VdGG recording activity. That means, necessarily, an amount of VdGG-style writing so that we’ve got stuff we can get our teeth into. It’s getting there, gradually, and so are we, though as I write we still don’t know where, when or how we’ll be going about things. Expect news of something or other in the very near future." - Peter Hammill in a Newsletter. "The VdGG album in prospect should start to get under way around spring for possible release later in the year." - Peter Hammill in an interview with Prog-mania. Live Filmed Concert at Metropolis Studios - December 18th 2010. 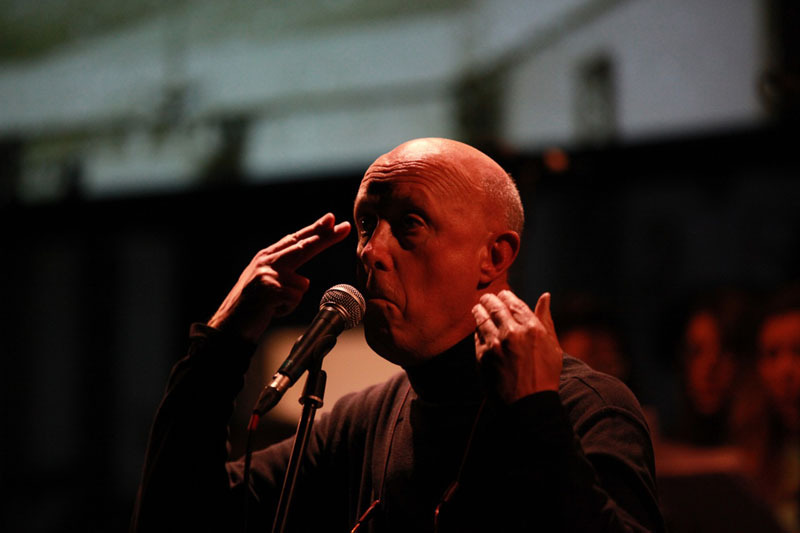 "Led by the unique vocal of Peter Hammill, VDGG join us as the last concert this year at Metropolis, and will provide an audience of just 140 people an opportunity to meet and sit in on a concert with one of the most revered progressive rock bands of the seventies. 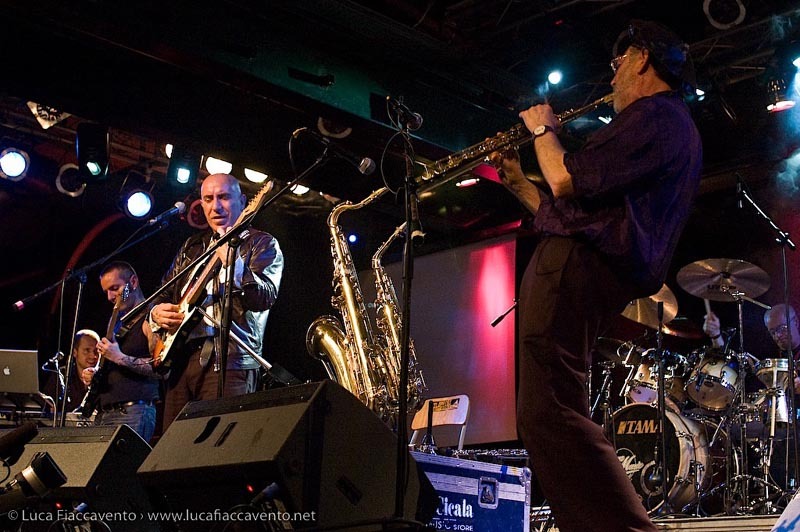 Often compared with King Crimson at their finest, respect and indeed reverence for VDGG has never waned." 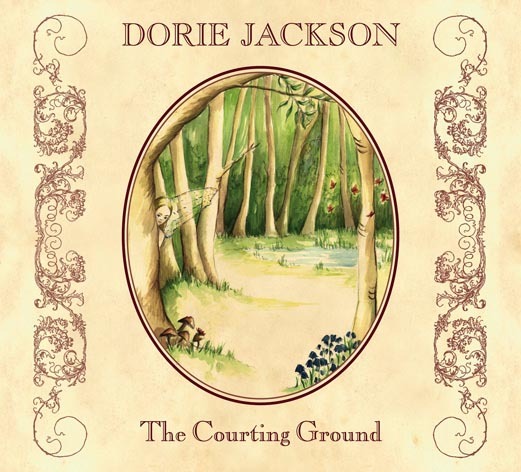 David Jackson's daughter Dorie has a great first album out called The Courting Ground, on which David plays saxes and flute. You can order it here. Equally great is the first single by The Tribal Elders. 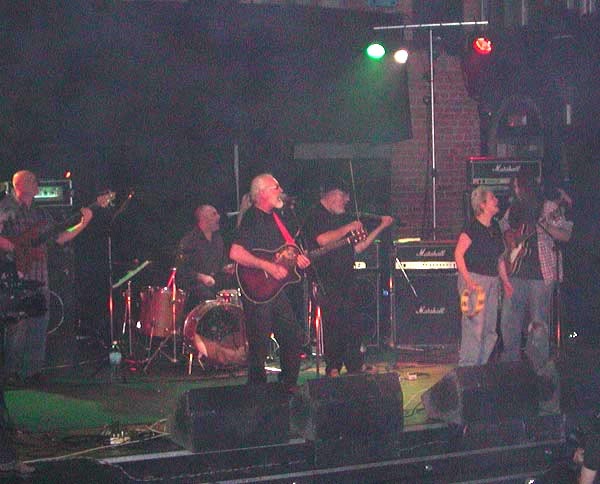 The band consists of Judge Smith, David Jackson, John Ellis, Michael Ward-Bergeman and Rikki Patten. along with Judge's latest release: "The Climber". Real Time was released in Japan on July 25th in a cardboard sleeve with a bonus CD containing tracks from other 2005 shows and a piece recorded at the Amsterdam soundcheck. June 28th Interview with Peter Hammill for the Russian site. 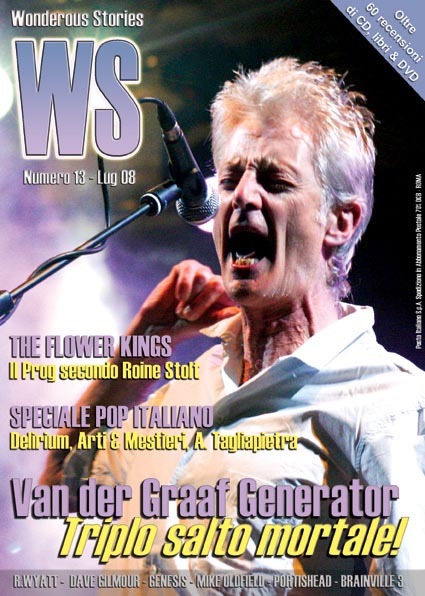 DPRP Interview with Peter Hammill in Verviers on Jan 28th 2010. 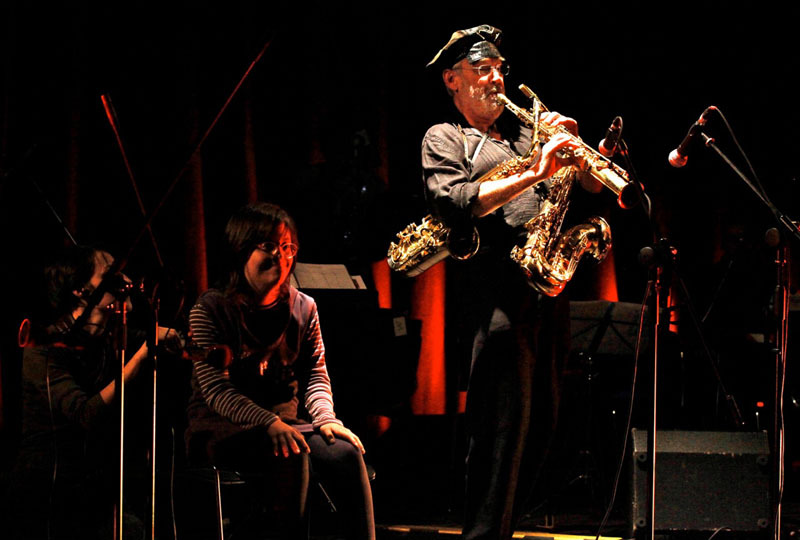 PH interviewed in Performing Musician - December 2009. My tribute to Jamie Fogg can be found here. The Spring/Summer (2009) edition of Progression magazine featured a 12 page article about VdGG that includes in-depth interviews with PH and HB. that included input from PH. Read and listen to PH on NPR. The Italian Magazine Wonderous Stories featured a big spread about VdGG in the July issue. See Jim Chamberlain's PH/VdGG site for coverage of PH's June 2008 trip to the USA. 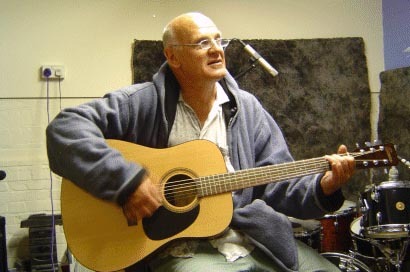 Peter Hammill in Spain (May 2008). 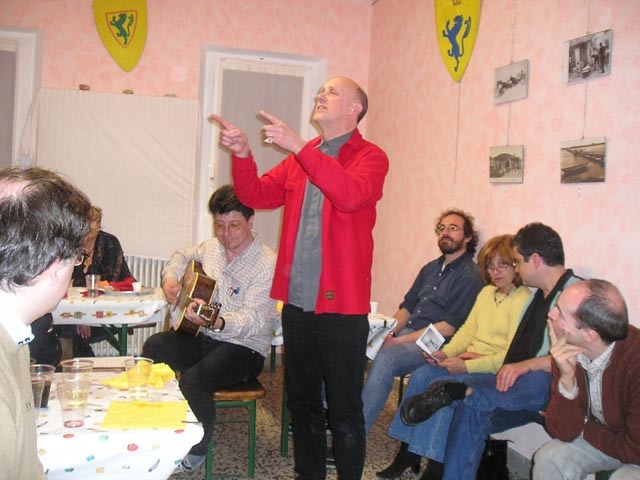 A new live CD: 'Nic Potter and Friends - Live in Italy' was released on June 12th. For further details visit www.nicpotter.com. Schizo Fun Addict released a limited edition coloured 7" vinyl single of their cover version of Theme One on May 19th. The single is out on the Fruits de Mer label and you can listen to the track here. 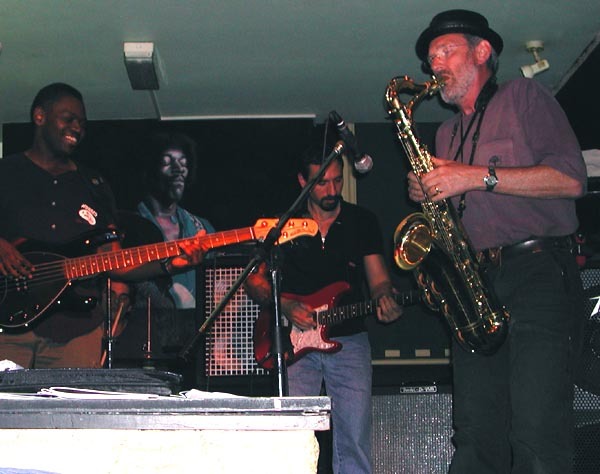 David Jackson playing with Italian band Osanna at Stazione Birra in Rome on April 23rd 2008. Italian TV Channel RomaUno broadcasted the Umbertide show of July 22nd 2007 as part of the TV program INDIE during the two weeks beginning Nov 4th: www.romauno.tv. The German TV station WDR broadcasted the complete VdGG concert from Leverkusen (5th Nov 2005) on Monday 20th August at 0.45 a.m. (CET). The show lasts 105 minutes (a shortened version was broadcast in Jan 2006). Astonishing News! A second copy of the un-released UK version of the Aerosol Grey Machine has surfaced, this time with a white label LP. 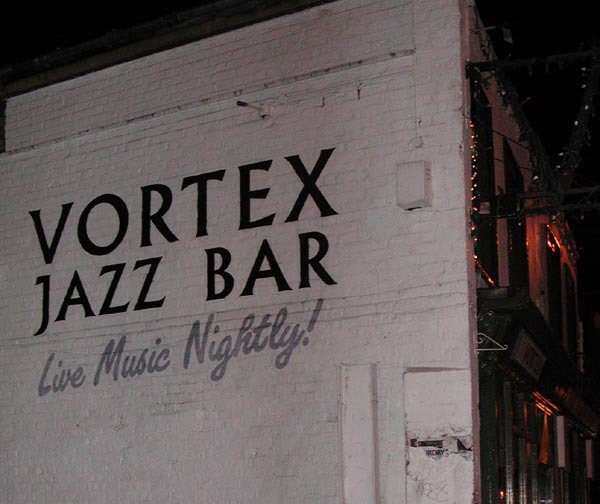 The album was found by a second-hand record dealer in the UK (Replay Records, Grimsby, Tel 01472 351125, email). The sleeve features a picture of a girl with a spray can - see the Aerosol Grey Machine page. Peter Hammill's solo albums Sitting Targets, Skin, And Close as This and The Love Songs were released in re-mastered form on September 3rd. "You Hit Me Where I Live" is a bonus track on Skin - Buy here. Dave Jackson has been working with Judge Smith on the scores for "Twinkle", which will be performed at The Anvil, Basingstoke on July 11th 2007. It will feature young able singers and dancers, some large monsters and disabled Soundbeam musicians. It is a musical story about Greek mythology. 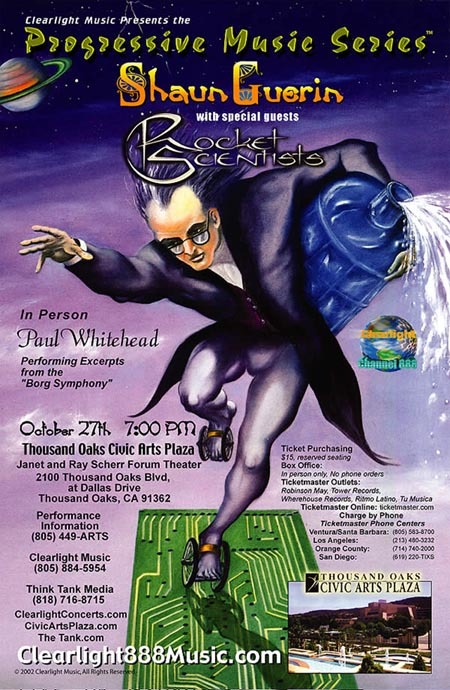 - News from Dave Jackson - October 2006. See Sean Kelly's pictures here and here. 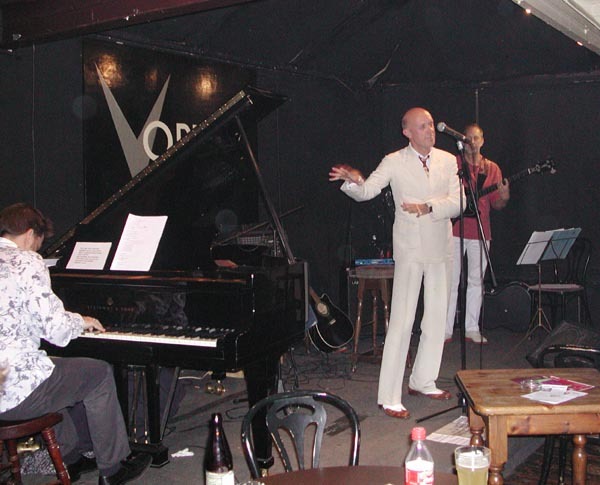 "After a period of consideration and some exploratory rehearsal sessions over the summer, Hugh Banton, Guy Evans & Peter Hammill are now looking forward with excitement to the next phase in the VdGG reunion. They expect to be doing shows in the first half of 2007 and will also be recording new material in this period with a view to releasing an album later in the year. 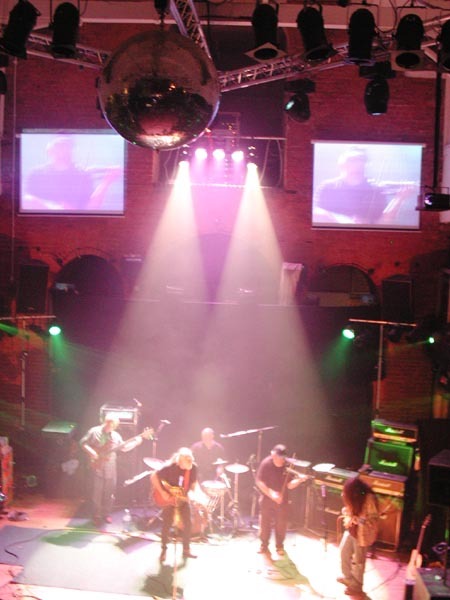 Van der Graaf Generator is now a trio consisting of the three surviving members of the original 1968 formation. 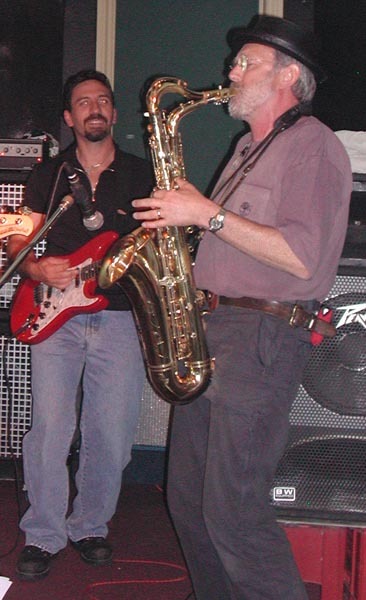 David Jackson has not been a member of the group since November 2005." 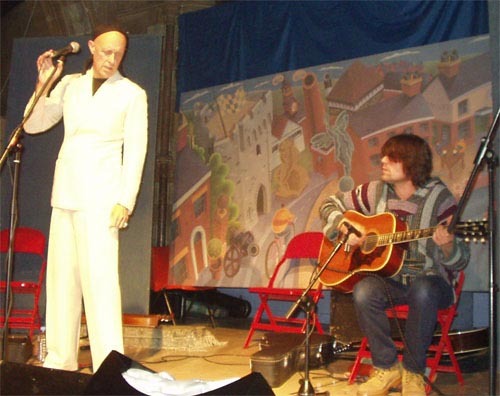 - News from SofaSound - September 27th 2006. From July's Mojo: Has The Graaf Sunk? Fred says: "Good news. We asked a Van der Graaf spokesman, who revealed, 'VdGG are continuing - they're reconvening [in July] with the intention of future live dates and recording.' He added that a live CD from the Royal Festival Hall show of May 6 2005 is being readied for release, as is a live DVD, possibly from a performance in Germany. Release dates to be confirmed!" 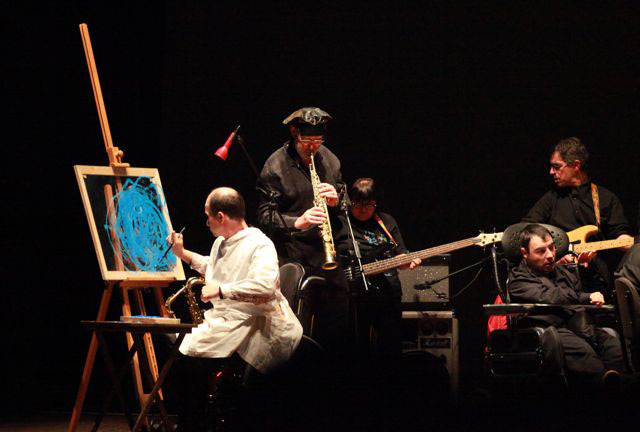 Long live Van der Graaf Generator! 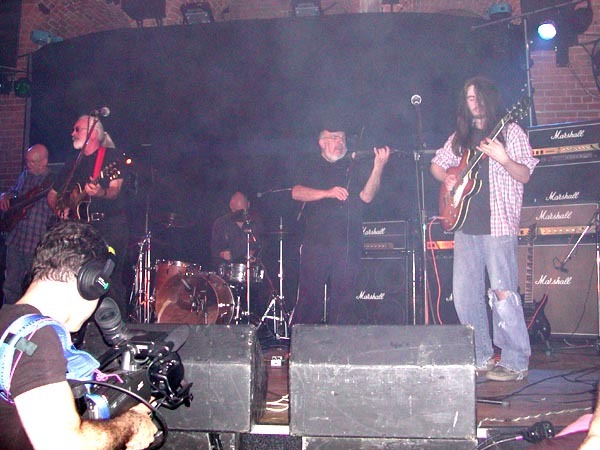 "At present there are no plans for any further shows or recordings for this incarnation of Van der Graaf Generator. After the experiences of the last couple of years I'm reluctant to utter the word 'never' in the context of the group but it does seem unlikely that this line-up will attempt anything else in the immediate future. A fascinating ride it's been but time's up. In due course I expect we'll explain things further." Re-masters released on July 25th: World Record, The Quiet Zone and Vital. 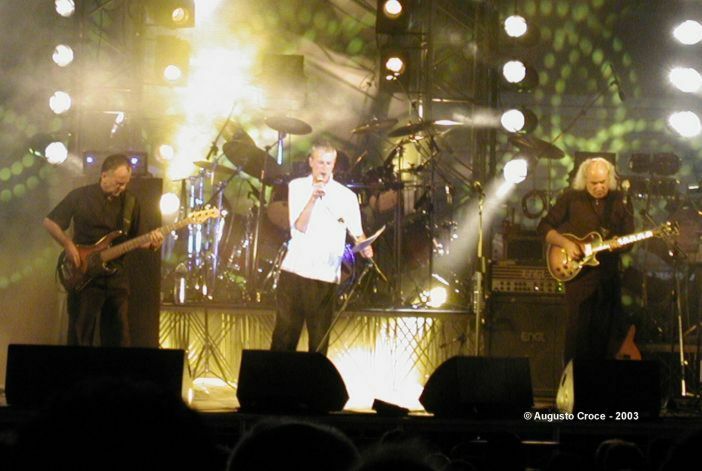 Van der Graaf Generator at the Royal Festival Hall - 6th May 2005. Present - the new VdGG album. 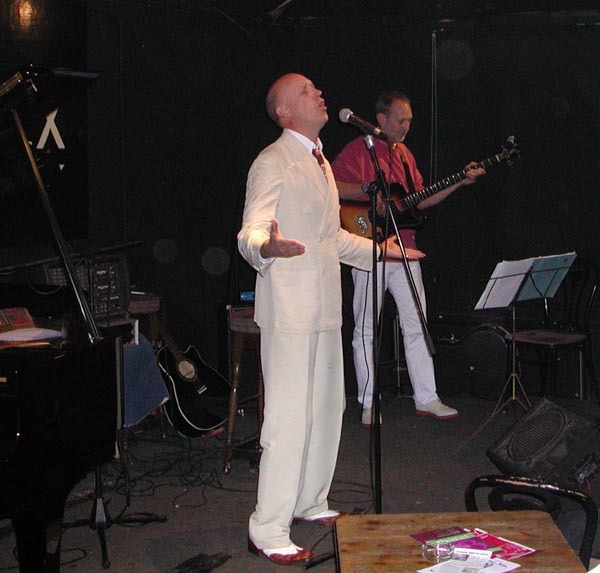 Judge Smith at the Cobden Club - 6th May 2005. Godbluff, Still Life and Fool's Mate. 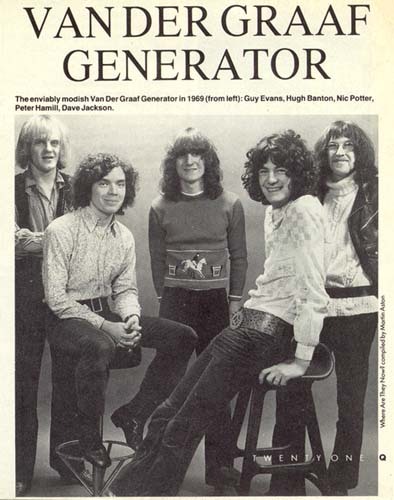 Van der Graaf Generator were mentioned in the Guardian's Friday Review on April 1st. And in a piece about the funeral of Tommy Vance in the Telegraph. Vance died on March 6th. 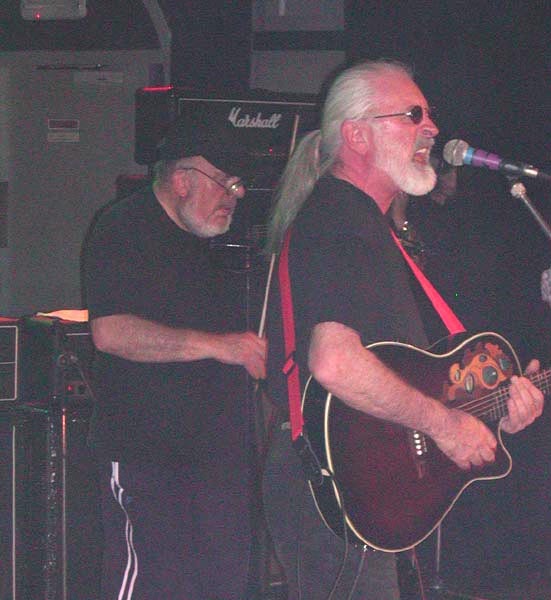 Judge Smith has recently been in Italy (March 2005) mixing his latest release "The Full English" at LOL Productions, and entertaining the Italian Peter Hammill and Van der Graaf Generator Study Group. 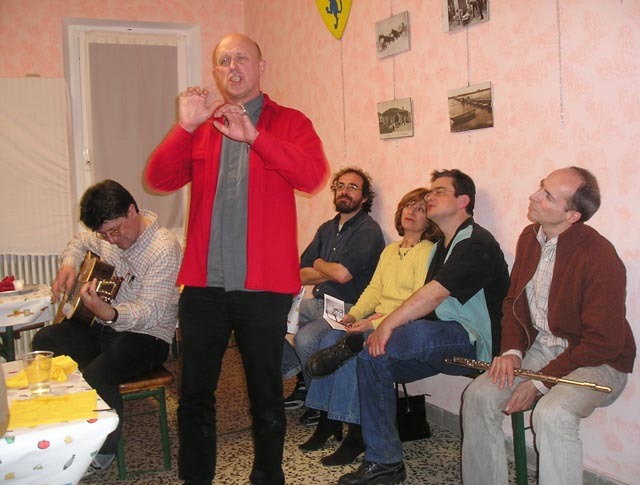 The Study Group hosted a party for the members, including Francis Tamarit who sent in the pictures (taken by Mazug), and Judge, during which Francis and Pietro Poggi, on flute, accompanied Judge on a few of his numbers. By the sound of it a good time was had by all. 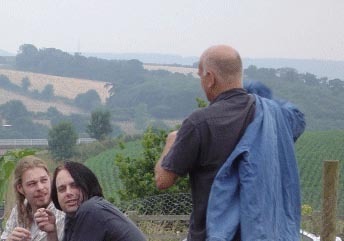 Guy Evans in Devon during the recording of Subterraneans album Soul Mass Transit. Err... Is that a guitar Guy? In case you missed it on the front page, both the VdGG and Judge gigs on the 6th May are sold out. This from the Judge publicity machine: "...In fact, after a two year lay-off, during which he built and equipped a new studio and wrote a large book (yet to be published), he has now completed two new CDs. The first of them to be released will be 'The Full English', on the Italian label 'Labour Of Love' (www.lol-records.com). 'The Full English' is an album of songs, rather than a songstory like 'Curly's Airships', (and a single CD rather than a double). 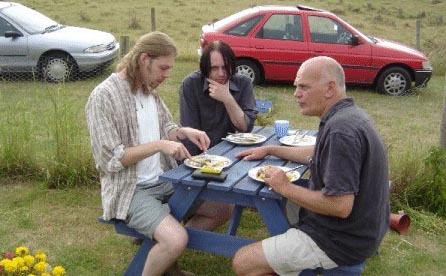 It features Curly guitarist John Ellis, and Michael Ward-Bergeman, the American accordionist, pianist and organist, with René Van Commenée (who played tabla for the Curly project) on drums and percussion. 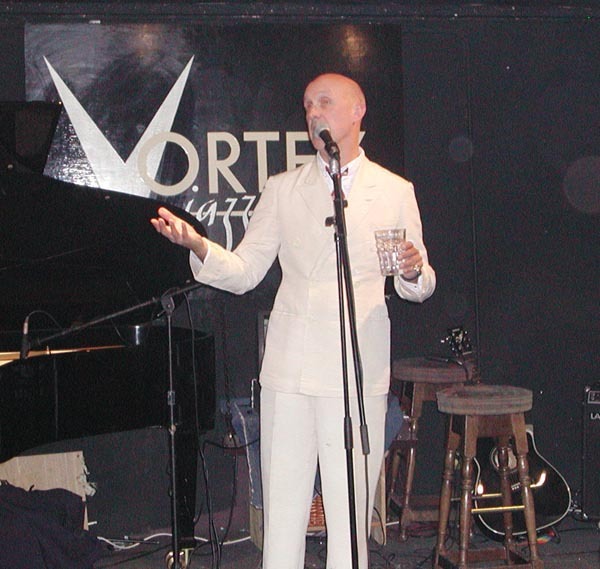 The album will be launched at a lunchtime concert on Friday 6th May, in London, at the Cobden Club (170-172 Kensal Road, W10 5BN), a delightful miniature Victorian theatre, with food available, within easy walk of Westbourne Park tube station. Judge will be appearing with the musicians from the album, and will play an hour's set, (including one number from 'Curly's Airships'.)" 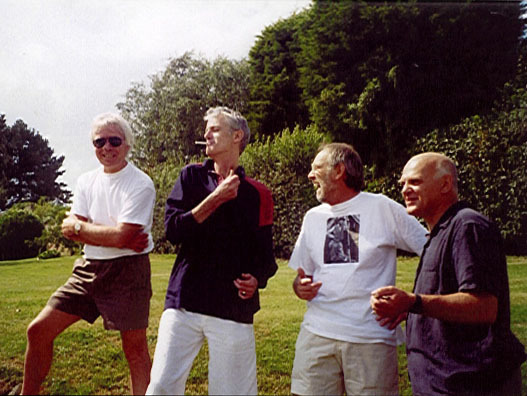 On Monday 29th November Van der Graaf Generator announced their reunion, a reunion concert and a brand new double album release for 2005. 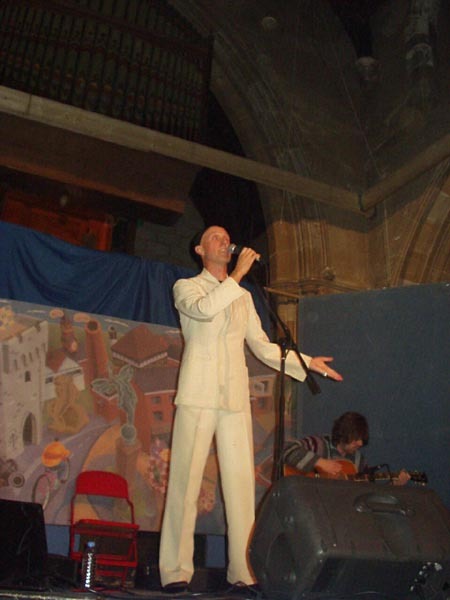 Peter Hammill was on tour in Europe when the VdGG reunion announcment was made. Click on the image for information, setlists and photo's displayed on the very comprehensive www.couchnoise.com website. 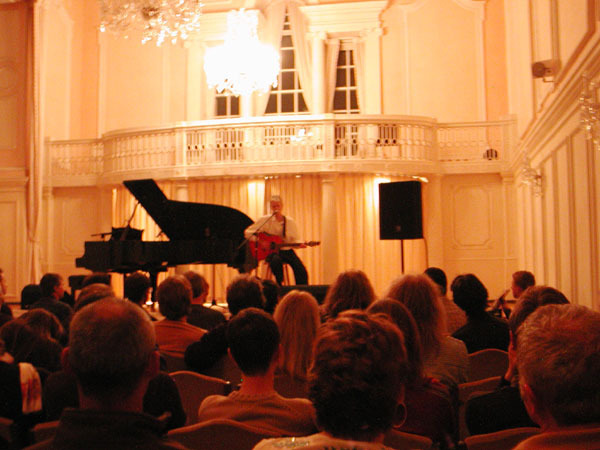 On the night of 6th November Italy's RAI 2 broadcast Peter Hammill receiving the Tenco Prize recently. Although Hammill played 5 songs, only one was broadcast. The setlist was: The Siren Song, A Better Time, Bubble, Vision (transmitted) and Still Life. Thanks to Peo Campora for the piece (translation to follow). 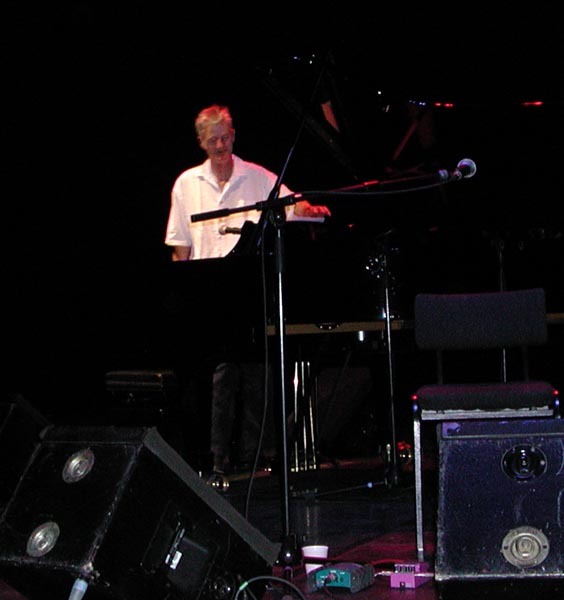 Peter Hammill at the Queen Elizabeth Hall in London, 8th October 2004. A poor picture because my camera decided to play up, but a good show. 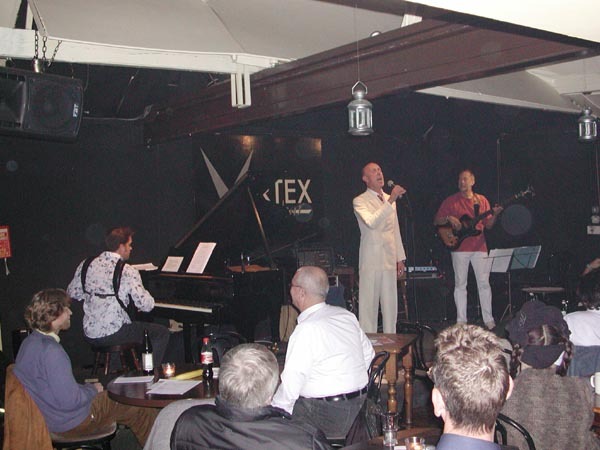 David Jackson and Guy Evans were in the audience but didn't join Hammill on stage this time. Setlist: My Room, Siren Song, Better Time, Gone Ahead (From Incoherence), Vision, Comet, If I Could, Amnesiac, Shingle Song, Patient, Easy To Slip Away, Bubble, Four Pails, Stranger Still, Traintime, Still Life, In The End (Encore). 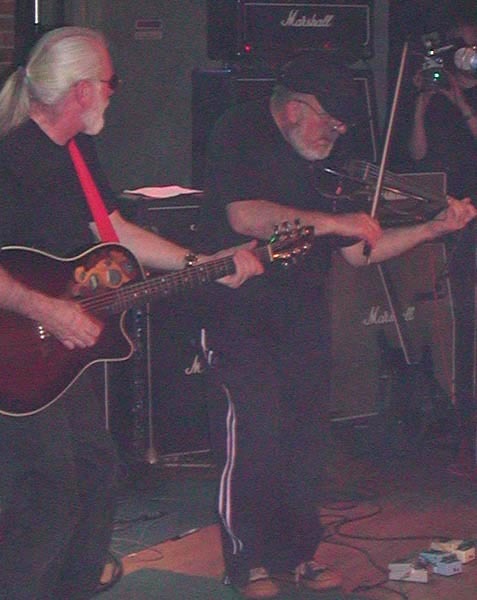 This is String Driven Thing, the band that Graham Smith was in prior to joining Van der Graaf in early 1977. Graham is actually a violin teacher in the Bristol area but plays the occasional get-together with Chris Adams and the rest of the band. 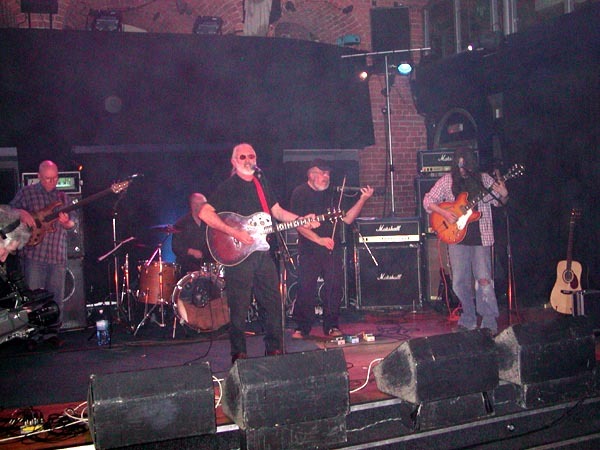 This gig took place on Thursday May 13th 2004 at the Buttermarket in Shrewsbury. There will be an interview with Graham on this website in the near future. 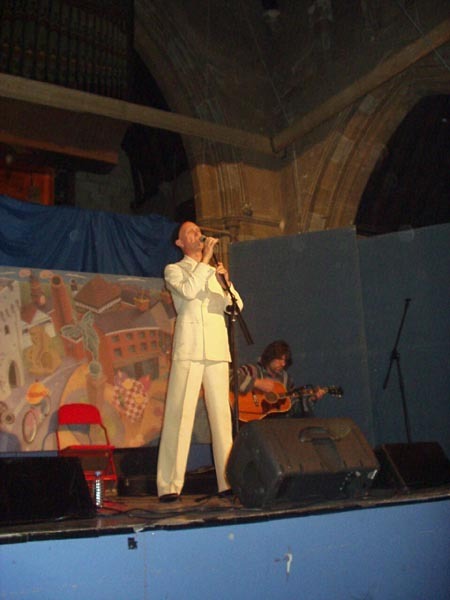 Here are some pictures of David Jackson playing in an old church in Guastalla, Italy during the period 9-14th March 2004. Francis Tamarit travelled to Italy from Geneva in Switzerland for the event and was lucky enough to play with David on the 14th. 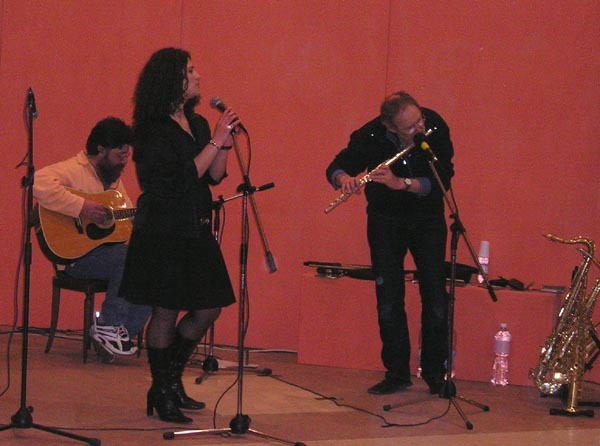 The trio, shown above right and including singer Pamela Acestilli, played Peter Hammill's The Birds and Vision. David also played with Re-Collage at Dolo and it is expected that this session will be released on DVD. You heard it here first! Thanks to Francis for the material, Mazug and Stefano for the pictures. Here are a couple of pictures of Nic Potter, post Van der Graaf. 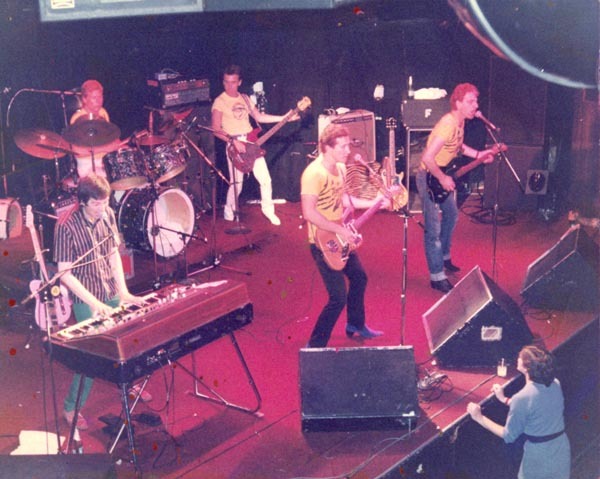 On the left, Nic is playing with The Tigers in 1980 at the Whisky-a-Go-Go club in Los Angeles. He also appears on the Tigers 'Savage Music' album. 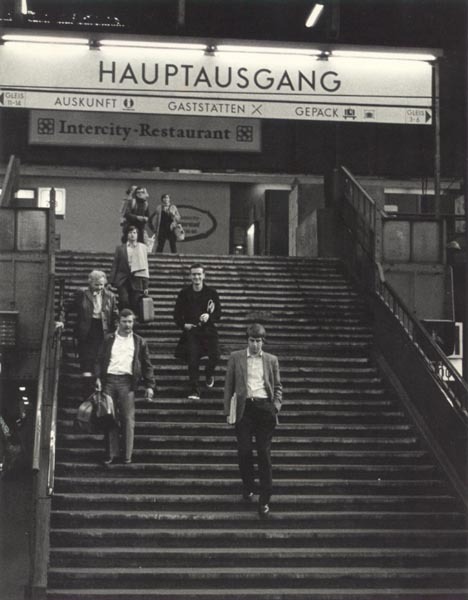 On the right is a picture of Nic taken by John Ellis at Hamburg railway station. Nic had just been to buy a newspaper prior to their rail journey to Berlin through East Germany. This was in either 1981 or 1982. Thanks to Nic for the pictures. A new CD from David Jackson. 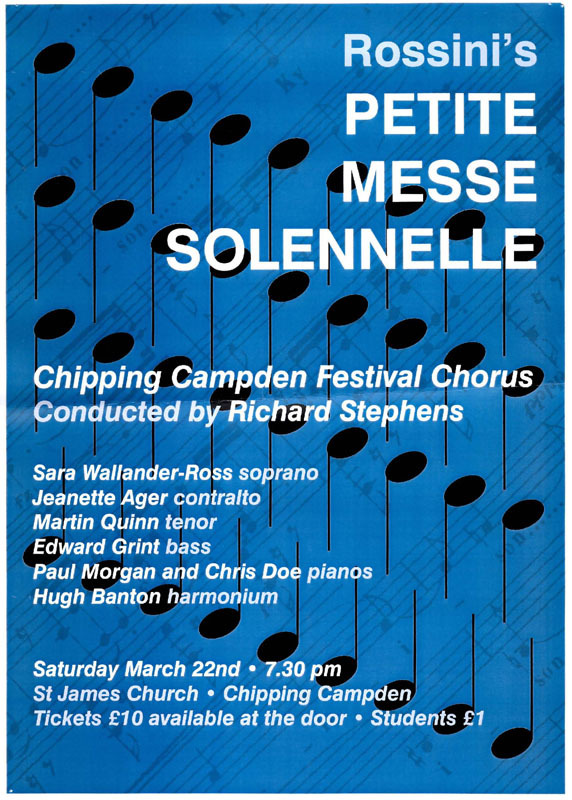 This is live performances from 1992 and 1993 with René van Commenée. For further details and a review click on the image. A bit late coming as its been out for a few weeks now but here's a link to www.thetangent.org, where you can buy "The Music That Died Alone", the product of David Jackson's latest collaboration. The Lost Demo Tape featured in Record Collector, September 2003.
on the 7th October 2003. 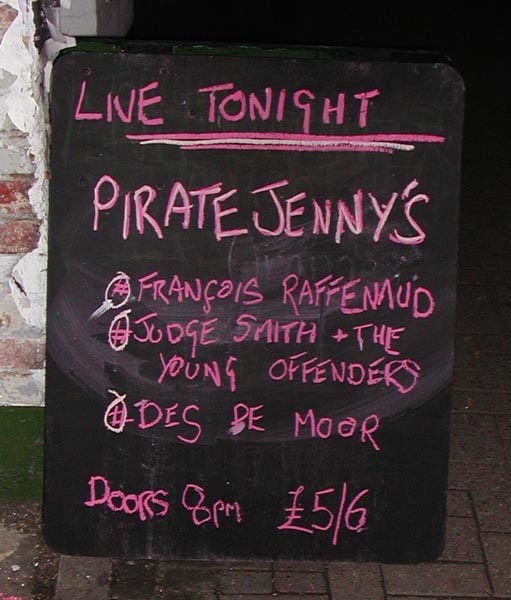 Judge Smith and the Young Offenders in full swing; Lene Lovich enjoys the show. 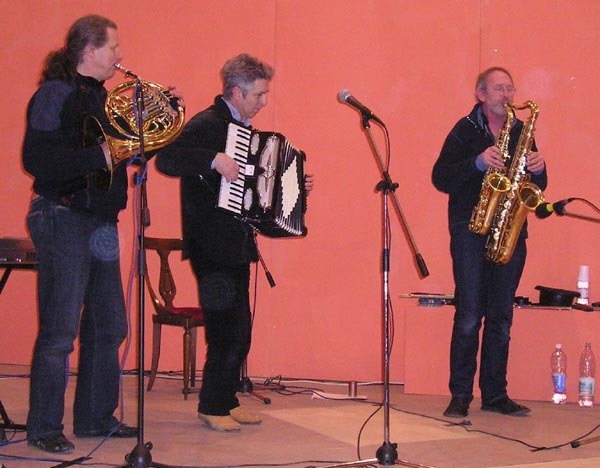 The Young Offenders consisted of Ian Fordham on bass and Michael Ward-Bergeman on piano and accordion. 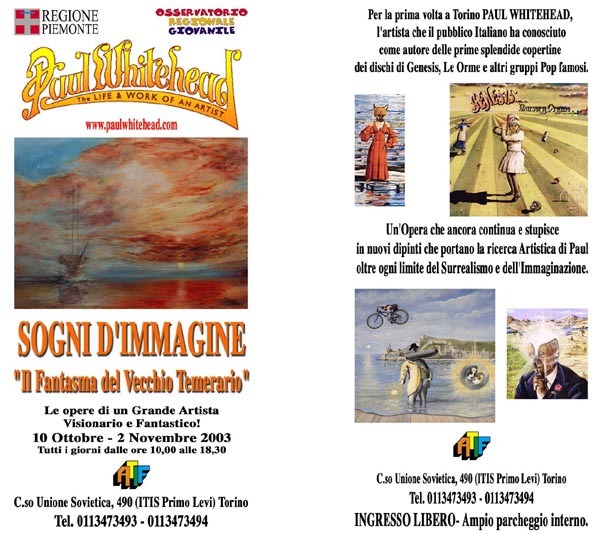 Paul Whitehead, creator of early VdGG album artwork has a retrospective gallery show in Turin, Italy running from 10 October to 2nd November 2003. Click on the image for more information. 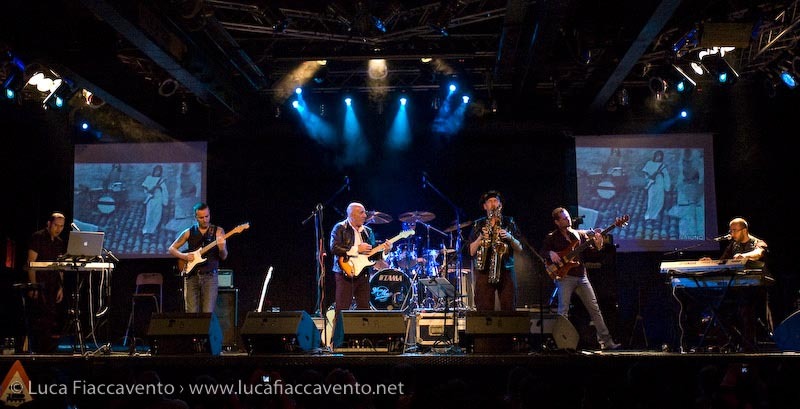 Thanks to Augusto Croce for this picture of Peter Hammill playing with PFM in Italy this summer. 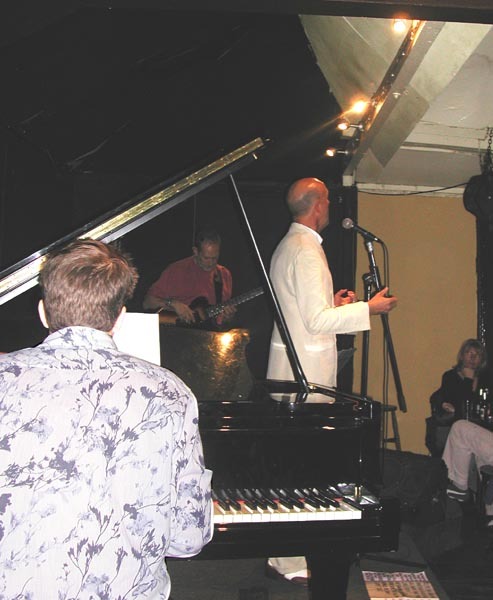 David Jackson has released a DVD (July 2003). 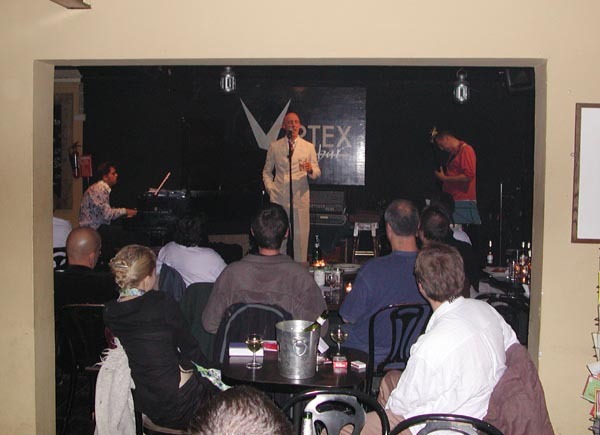 This is an official recording of Jaxon's show in Guastalla, Italy in November 2002. Click on the image for more information. Guy Evans seen here playing on a Saturday afternoon (14th June) at a pub in London called The Prince, as part of the Stoke Newington Fringe Festival. He was part of a three piece called Reconnaisance which included Julia from Echo City. A welcome return to this intriguing ensemble after a festival debut in N16 Flowers last year. As its name suggests it sets out on daring sorties into unusual musical terrain that can be hazardous. 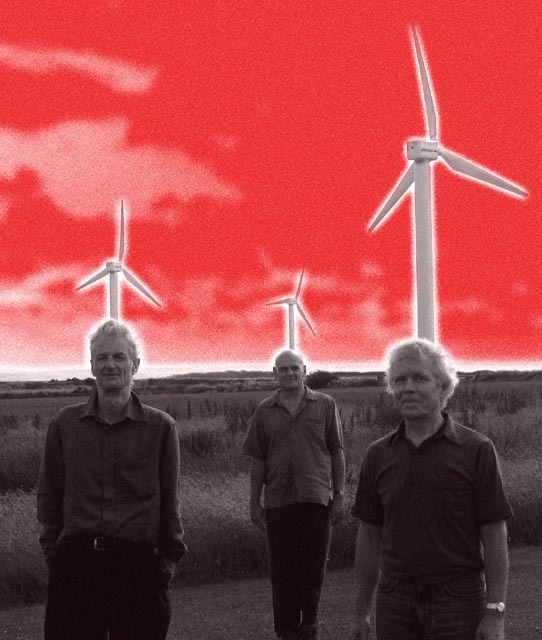 Deftly piloted by Van de Graaf Generator drummer Evans the ride is guaranteed groove-rich and lyrical." 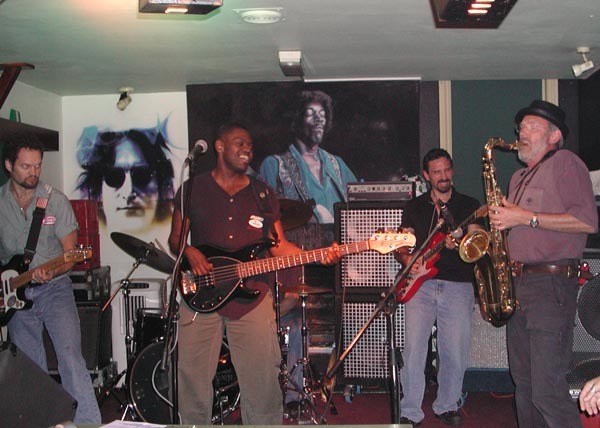 Sean says that the Reconaissance gig was a small set up in the corner of a pub. 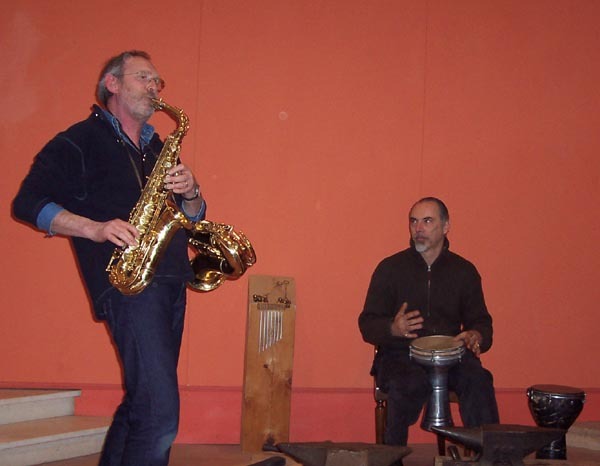 They started at about 5.30pm, Julia on bass and flute, Mark on bass and french horn and Guy on drum kit and electronic pads - set to all kinds of sounds - oh yes and that yellow pot with holes in - a kind of indian hand-drum? They played what sounded like jazzy improvisations - making much use of sample and repeat on the lead instruments - flute or fr. 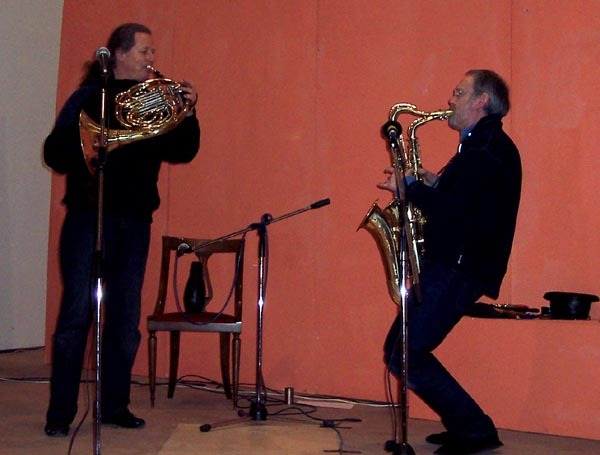 horn - controlled by way of foot pedal. 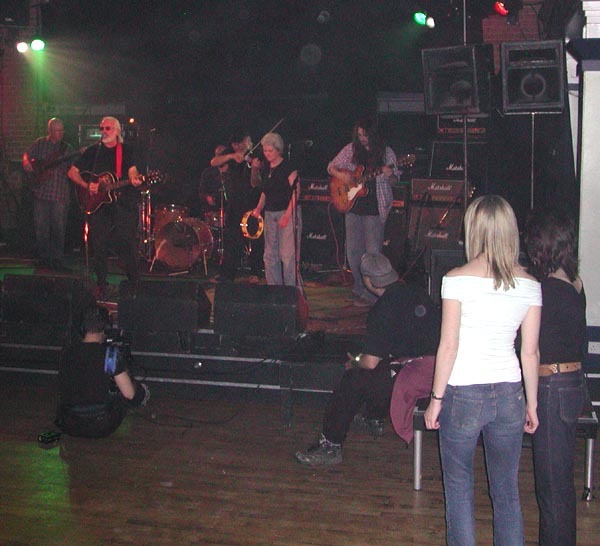 It was a free gig - amongst a multitude of free gigs as part of the fringe festival - but the punters there seemed to really enjoy it. The french horn in particular made a very impressive sound when, in effect, multi-tracked. The band had one or two technical problems with the sample / loop system which seemed to have bothered them more than it did us crowd. 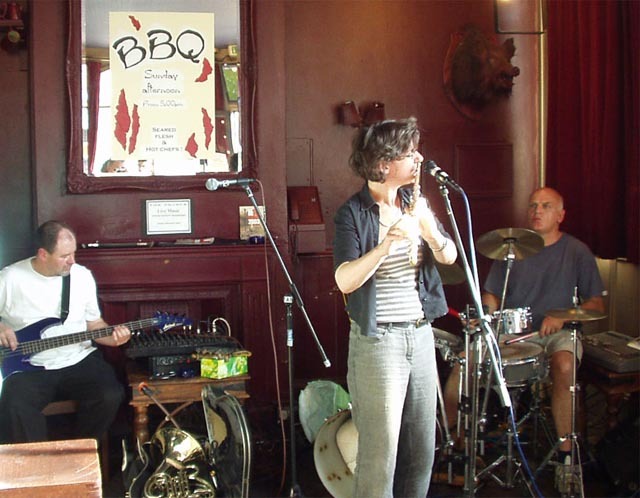 I thought it was a real nice mellow gig for a hot sunny afternoon - the doors were open and people floated in and out whilst Julia's flute became a multi-tracked horde of diving and swooping twirls. Real good for free - as Joni Mitchell once said! 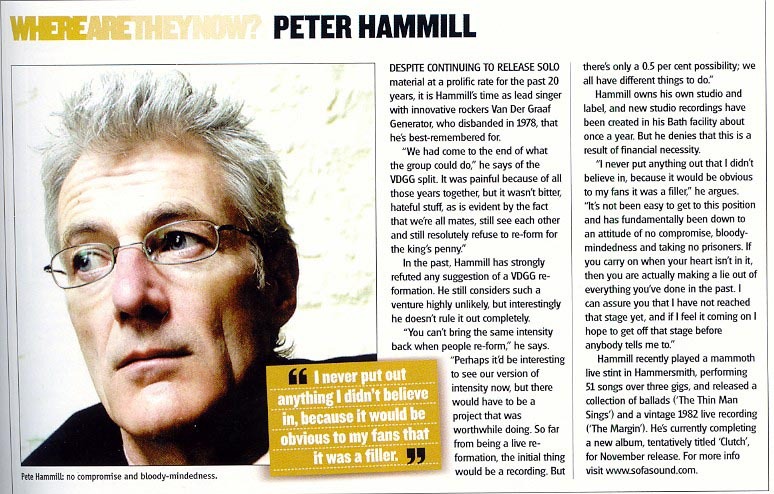 Peter Hammill gave this interview to Uncut magazine in January 2003. 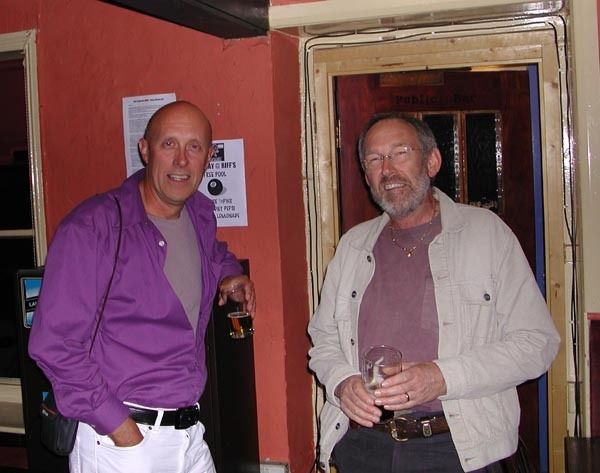 Judge Smith, pictured with Guitarist Rikki Patten, in Sussex, UK, in November. Judge's first live performance for ten years. 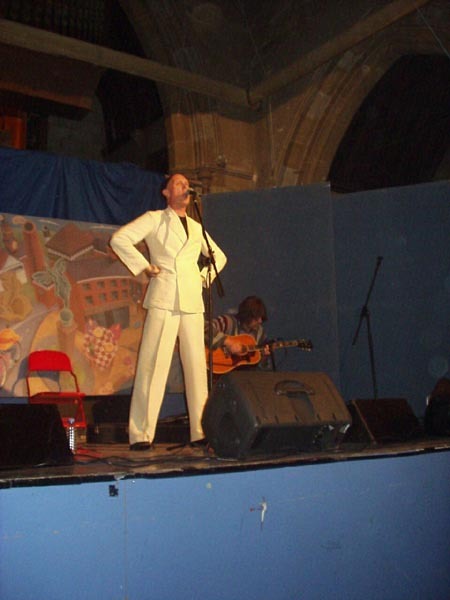 The event took place on November 29th 2002 at the All Saints Centre in Lewes. 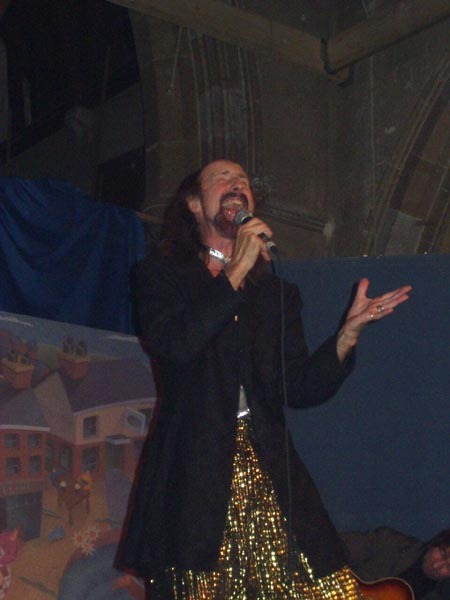 Judge was supporting a concert by Arthur Brown and sang three songs; "Carpet Tiles", "We'll Always Have Paris" and "The Final Taboo". Thanks to Sean Kelly and Peter Ostrowski for the pictures and information. 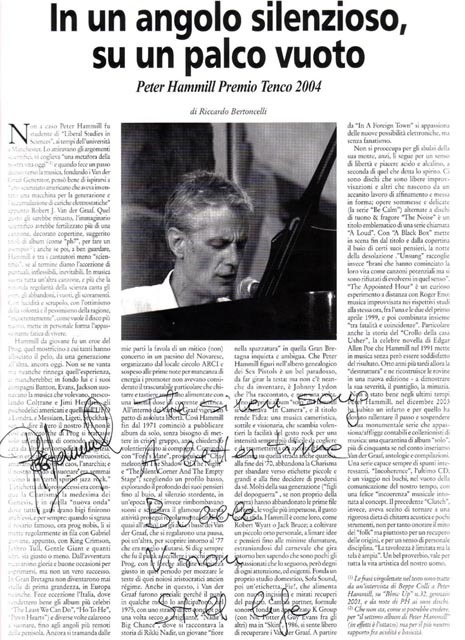 Peter Hammill gave this short interview to Classic Rock magazine in September 2002. Thanks to Kate George for the scan. Hugh Banton has just released J.S.Bach's Goldberg Variations on Peter Hammill's FIE! label (17th November 2002). Check out the page for info, reviews and soundbytes. 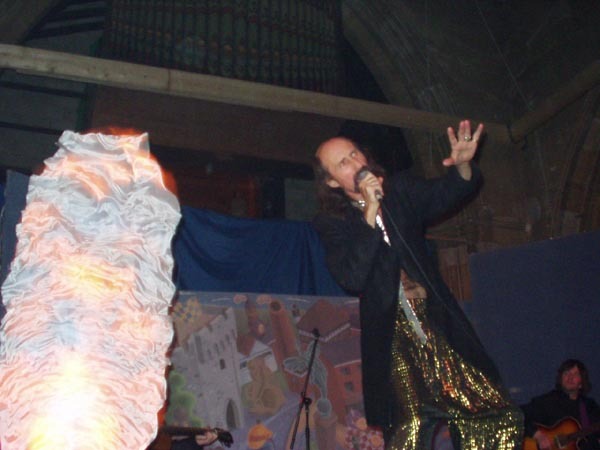 Paul Whitehead has just completely re-vamped his website, has a new manager, a record label that he has signed to and a band called the Borg Orchestra. 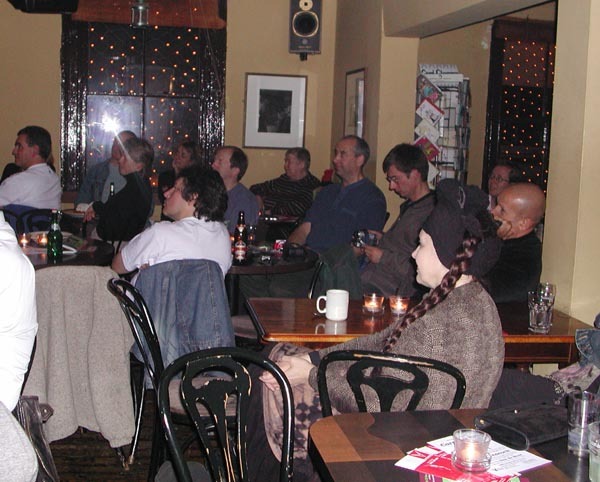 They recently performed excerpts from their upcoming "Borg Symphony" CD in L.A. (see poster on the right). 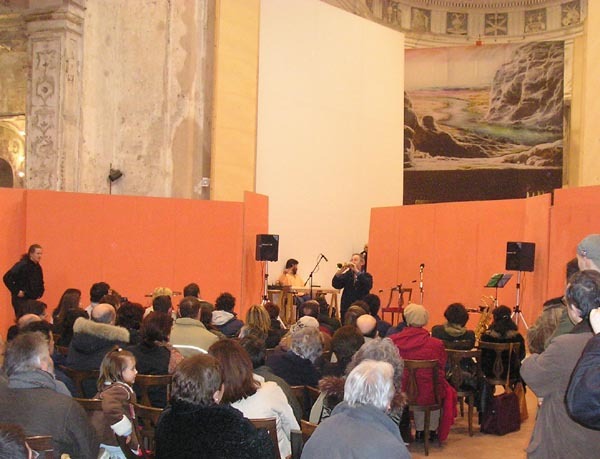 David Jackson was gigging in Italy in November. For more details check out www.jaxontonewall.com, a website set up to publicise the event. 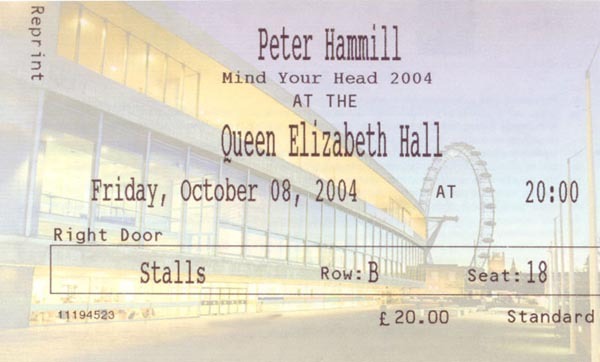 Peter Hammill played three concerts at The Hammersmith Lyric in London, accompanied by Stuart Gordon on violin, over the weekend of 14th/15th June 2002. I wasn't able to make it but a few artefacts have fallen into my inbox so here's a page. Thanks to Francis for the pictures and Jamie for the autographed ticket. You will also find the lyrics to a new song, "Just a Child". 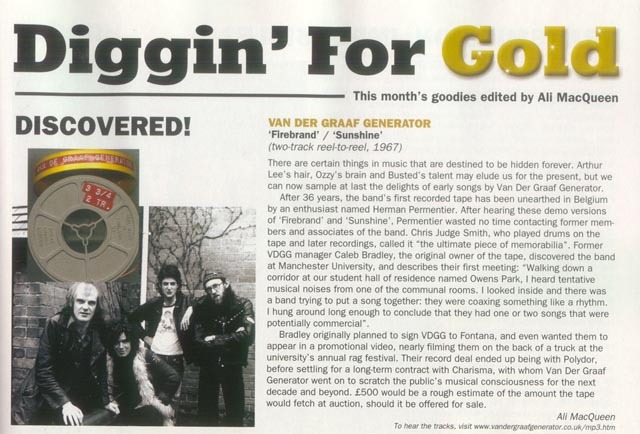 Check out Van der Graaf in MOJO - May 2002. 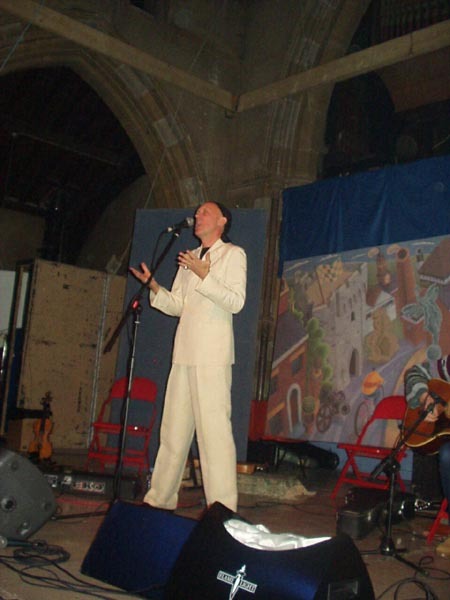 Tim locke interviewed David Jackson in Wellingborough in May 2001. Anvil Rings - What's it all about? Gordian Troeller left the music business and became a horse dealer. 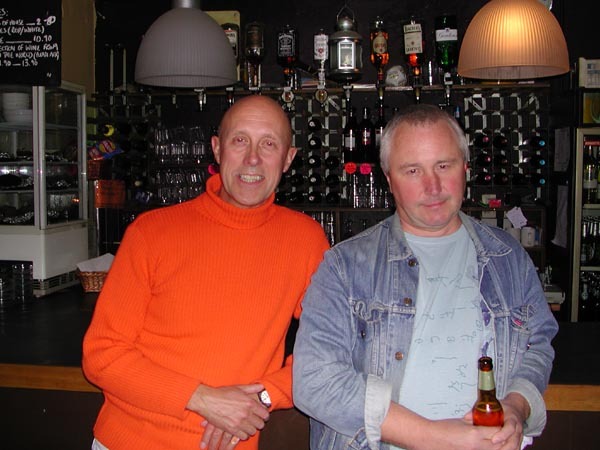 Tim locke interviewed Hugh Banton in Lymm in October 2001. Not a brilliant picture but the lighting was particularly bad. 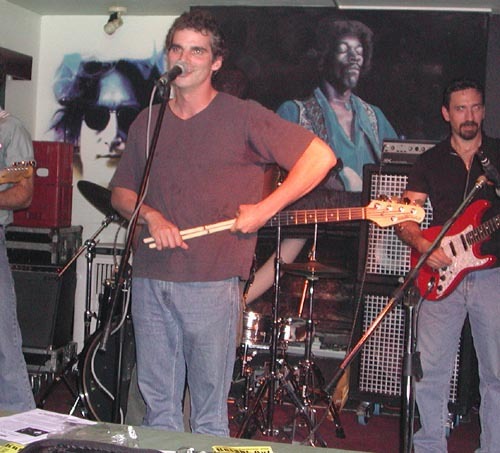 Anyway, here's Peter Hammill at Norwich, England on the 8th Oct. 2001. The band had a get-together on the east coast (of England) in July 2001. 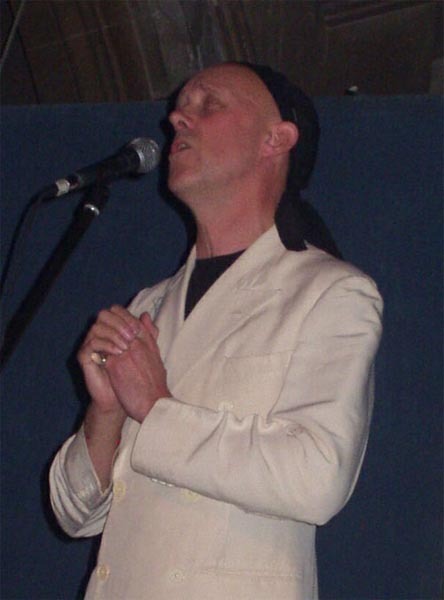 "Making a big percussive contribution to SOUL MASS TRANSIT is GUY EVANS, formerly of VAN DER GRAAF GENERATOR, now of ECHO CITY. Guy has been the backbone of mad magical musical space odysseys since before most of us were born and, in a world sadly devoid of Pete De Freitas, is the best drummer anywhere. 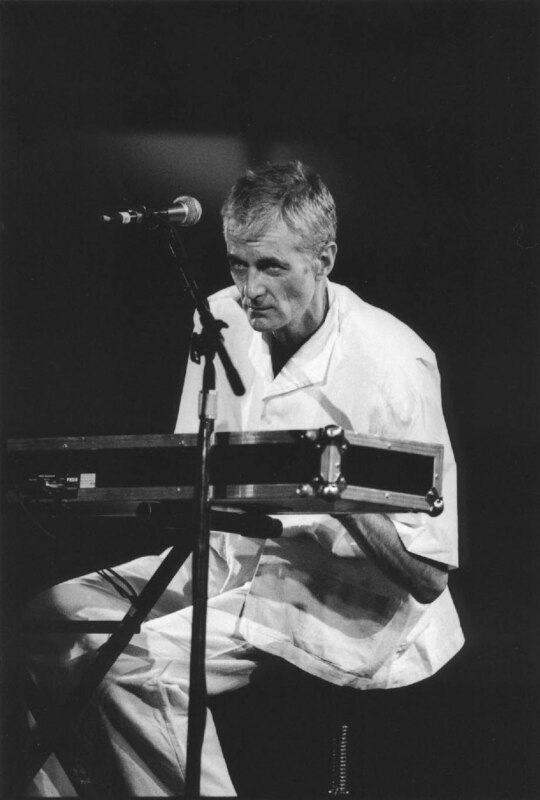 If you thought you knew what rhythm was, think again…"
Peter Hammill playing in Turin, Italy in April 2001. Photograph courtesy of Marco Zatterin. 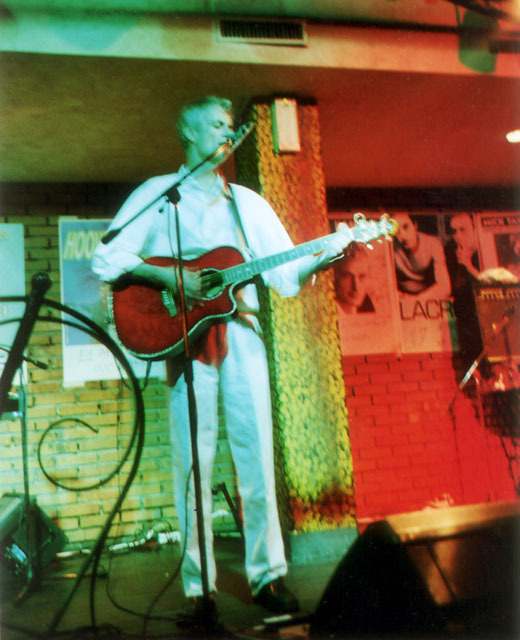 Peter Hammill playing in Mexico City, 25th February 2001. Photograph courtesy of Fernando Aceves. 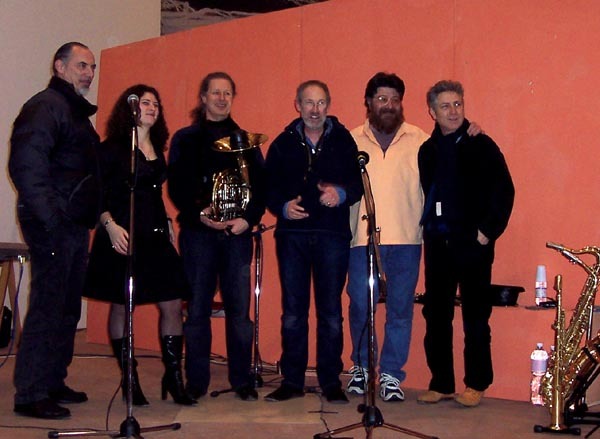 In the year 2000 the members of VdGG helped Chris Judge Smith launch Curly's Airships. There's a good picture of them all together here. This piece appeared in Q magazine some years ago.